There's nothing like turning on the shower first thing in the morning, stepping into a steamy, luxurious haven of... chlorine smell. Yuck! Perhaps it's a little annoying, and you don't give it a second thought. Or maybe you have read the studies that flash back into your mind every time you step into your shower, er, gas chamber. Today is the day that you finally decide to break the annoyance and purchase your very own Showerwise Shower Filter! Good for you! 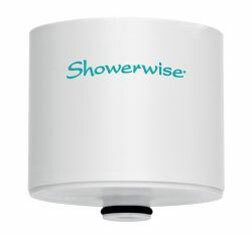 The Showerwise Shower Filter removes chlorine (95%) and other harmful contaminants. It also reduces iron, lead, arsenic, mercury, hydrogen sulfide, several types of bacteria, algae, fungi and mold. 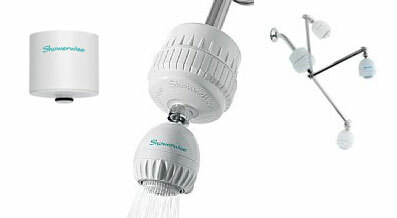 See our "Showerwise Deluxe Complete System" below! Replace approximately once per year, depending on use. Get $3.00 off and no additional shipping when you order two using the button below! If you are concerned about your shower head being too low, or if your shower head is too high for small children, the chrome extension arm might be just what you need. As you can see in the picture, the shower head can go above the filter, and anywhere between that and fully below the filter. In the picture you can see that the filter housing and shower head for the Showerwise are not located right next to each other. This prevents the weight from getting too heavy for the arm to handle. I put one of these on my shower recently and it was very simple to do. I'm really happy with the new adjustable height for myself and two small children. Showerwise® effectively removes chlorine and other harmful contaminants. Your body can absorb more chlorine in a ten minute shower than from drinking the same water all day! Also reduces iron, lead, arsenic, mercury, hydrogen sulfide, several types of bacteria, algae, fungi and mold. Say goodbye to dull hair and irritated, itchy skin with Showerwise®. 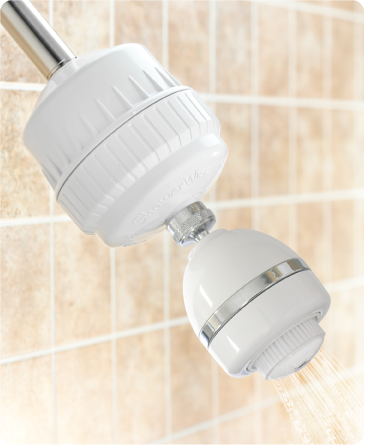 No special tools required—simply remove your existing showerhead and install the Showerwise®. Low maintenance! Filters typically need replacing once a year, depending on your water quality and frequency of use. Believe it or not, bathing and showering in unfiltered, chlorinated water is even more harmful than drinking the same water. Taking one shower is as harmful as drinking contaminated water all day long. Not only are toxic substances inhaled, but they are also absorbed through the skin. "Showering is suspected as the primary cause of elevated chloroform in nearly every home because of the chlorine in the water. Chloroform [a known carcinogen] levels increase up to 100 times during a ten-minute shower in residential water"